The goal of the California Tobacco Control Program is to keep tobacco out of the hands of youth, help tobacco users quit and help everyone be able to live work and play in tobacco free environments. On a local level our Health Educators work with retailers to make sure they are in compliance with state regulations, collaborate with Multi-Unit Housing facilities to create smoke-free living environments, and provide education to local schools and community events. 12 out of the 28 Multi-Unit Housing Complexes in Tehama County are Smoke-Free. It has been widely-reported that tobacco causes a wide range of health issues from heart disease to lung cancer to respiratory problems. Health issues may not only come from actually smoking, but also from second and even third hand smoke. Recently the Tehama County Health Services Agency campuses became smoke-free, meaning no smoking, no vaping, and no use of electronic smoking devices on campus. 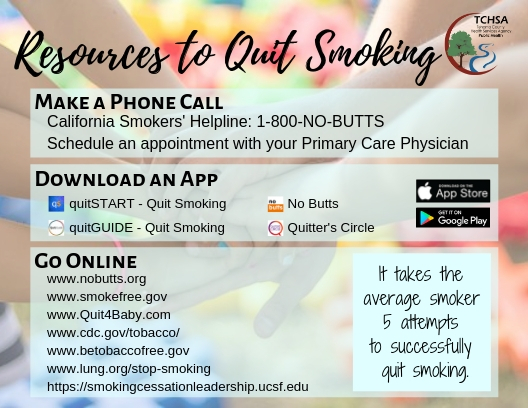 For anyone interested in quitting, or if you have a family member or friend that has expressed interest in quitting please contact our office for resources to help them through the process. Educational presentations, with examples of various types of tobacco related products, as well as examples of ingredients & effects of tobacco on your body.